In April of 1984, four men set out to fulfill their dream. The four men, from which the 4-Star logo came, had a vision of a superior trailer carrying the 4-Star name. After about four months, one of the partners decided to sell out; in 1990, another partner retired. Today, the owners and employees continue to guide 4-Star with innovative concepts and ideas. Holding a major portion of the trailer market, 4-Star now employees well over 200 people. Always continuing to improve and with the company-wide philosophy of maintaining superior engineering and quality workmanship, every new 4-Star has the same structural integrity as the first 4-Star. It is this belief that will keep 4-Star a force within the industry for years to come. With the growing number of companies building only production trailers, 4-Star has maintained its belief that every person is different, every load of stock is different, therefore every trailer should be different. Although every 4-Star is different in its design, all 4-Star Trailers are built with the same principles of strength, durability, and craftsmanship. Even standard 4-Star models were designed to make a useable trailer available for customers, but we understand that no one knows you or your cargo better than you. Back in 1984, the owners of 4-Star knew they had to build a strong trailer for two very important reasons. First of all, since every trailer was going to be custom built and potentially very different from the next, a strong core design had to be developed. This core, which can still be found in every 4-Star, allows customers to build the trailer that fits their specific needs. The second reason was somewhat simpler: aluminum trailers were still a novelty. People did not want to believe that aluminum was superior to steel. 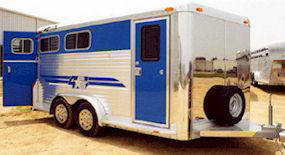 People believed that the lighter weight aluminum trailers would not hold up as well the traditional steel trailers. Therefore, 4-Star Trailers not only had to be lighter than the bulky steel trailers, but as strong if not stronger. With the obvious maintenance factors heavily in favor of aluminum trailers, 4-Star helped pave the way for not only its own niche in the market, but for the entire trailer industry itself. Where aluminum trailers being superior is now an afterthought, at 4-Star we take great pride in knowing that we helped changed the face of the trailer industry. To learn more about 4-Star visit their website by clicking here!